While both Africans and French troops are fighting against various terrorist and armed groups in North Mali, Rwanda and Mali will boost bilateral cooperation. Although Rwanda won't send troops to Mali (HERE), it will be "the voice" of the Mali at the Security Council, but will also share its experience in post conflict. Rwanda and Mali have also talked about Genocide convicts in Mali. The Minister of Foreign Affairs and Cooperation, Hon. Louise Mushikiwabo, received her counterpart of the Republic of Mali, Minister Tieman Coulibaly. Their talks focused on the current crisis in Mali as well as the ways to strengthen bilateral cooperation between Rwanda and Mali. The Minister of Foreign Affairs of Mali, Hon. Tieman Coulibaly, appreciated Rwanda’s contribution to the process of stabilizing Mali, especially through the United Nations Security Council (UNSC). He also commended Rwanda’s leadership and achievement in the last two decades. The Minister also transmitted the appreciations from the President of the Republic of Mali, Diankounda Traore to his Rwandan counterpart H.E. President Paul Kagame on a ‘clear position’ on the Mali’s crisis that he expressed at the recent African Union Summit in Addis Ababa. “Looking at political angle, the contribution of Rwanda is extremely important for Rwanda, Mali and Africa. 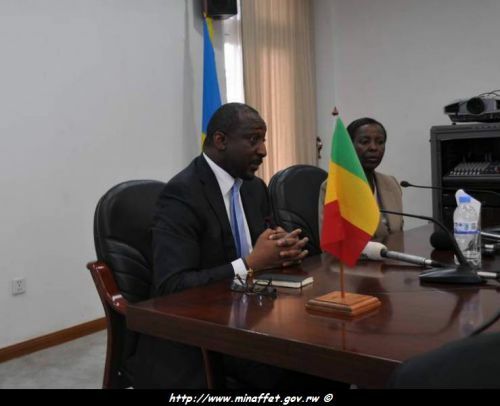 Mali can learn a lot from Rwanda’s achievement and leadership” said, Hon. Tieman Coulibaly. On the crisis in his country, Hon. Tieman Coulibaly said that Mali has been facing ‘strong terrorism in the North’ aiming at destroying the Nation, its civilization and unity and called upon the World ‘support. “We want to form a world of coalition to help Mali save its territory and unity. We want Rwanda during the next Chairmanship at UN Security Council to reinforce peace mechanism in Mali and continue to eradicate terrorism so that we can restore our Republic”.the Minister said. The Rwandan Minister of Foreign Affairs pledged Rwanda’s continued support especially through her chairmanship of the Security Council next month, through which Rwanda will have Africa’s interest as a priority. “At the UN Security Council, we will be Mali’s voice”. Hon. Louise Mushikiwabo also mentioned the continued sharing of information on the status of the crisis since it is a ‘situation which changes every day’. Regarding the bilateral ties, the Minister of Mali acknowledged having received information on the allegedly freedom accredited to Genocide convicts detained in Mali and pledged carrying out investigation and solve the matter as soon as possible. “It will be my personal task to get things where they must be. Mali is committed to the international law. We will do what we must do” Hon. Tieman Coulibaly underlined. Mali has been facing threats of armed groups in the North of the country and recently had the intervention of the French army to stop the advance of the terrorist groups. A UN Mission to stabilize the country is currently under discussion.